Caracol isn’t your typical Mexican restaurant – or at least what most would conjure up in their imagination when thinking of a Mexican restaurant. This is not the place for enchiladas with refried beans and rice. Billed as “Mexican coastal cuisine,” this upscale dining spot is the newest venture from Hugo Ortega and wife Tracy Vaught, having opened to rave reviews in late 2013 (and currently sitting at #7 on Eater’s Top 38 Houston restaurants). Whereas Hugo and Tracy’s other restaurants tend to feature a greatest hits compilation of Mexican cuisines, the Caracol menu draws its inspiration from the 16 Mexican states that border the oceans or Gulf of Mexico. Much like how the food in, say, the Amalfi Coast is very different from the food in inland Rome in Italy, the same holds true for the various regions in Mexico. Caracol’s focus on the sea is immediately evident upon walking into the space, where one is greeted by big, bright, bold images of underwater creatures from illustrator Charley Harper. So, you would be forgiven for thinking that it is all about fish from the word go (or from the word caracol, which is Spanish for snail or conch). But, while the emphasis is primarily on seafood (about 70% of the menu was once swimming), the restaurant has a much more complex and authentic-to-the-locals approach to its menu. They take this authenticity very seriously, making their own cheeses, chocolates, and their own vinegars for escabeches and marinades, all in-house. In response, Beck has curated an international list of wines, keeping the various flavors, textures and preparation in mind. For example, he sought out purer, cleaner wines for pairing with the many raw dishes on the menu. Although he is a Certified Sommelier, he credits much of his wine knowledge to tasting and talking with Tracy and Hugo when he first entered the restaurant industry. Originally from Rochester, NY, Sean met the duo when he started waiting tables at their Backstreet Café while still a student at the University of Houston Honors College. Now, 14 years later, he is responsible for the wine list at Caracol, as well as those at sister restaurants Backstreet and Hugo’s. In general, Beck is very bullish on Spanish wines and features quite a number of them on his list. 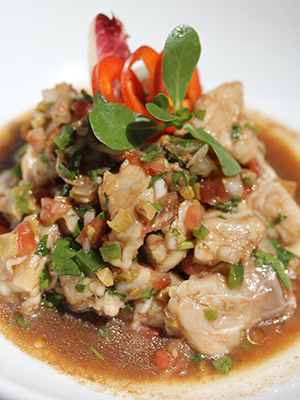 In particular, he has always enjoyed the flavors of Rueda for clean, cool dishes, especially those that feature jalapeño and tomato, making them great to pair with ceviches, such as Caracol’s Ceviche Acapulqueño (cured snapper with tomato, Worcestershire, onion, jalapeño, and lime). Beck notes that the brightness, natural heat and herbal profile of these wines, as in the Shaya ARINDO, which he carries by the glass, lends itself to these dishes. As mentioned, there is more to the menu than fish. Caracol also features wood-grilled and smoked dishes, which infuse the food with heavier flavors and thus impact the choice of wine. In answer to these flavors, Beck likes the depth and suppleness of Ribera del Duero wines, with their polished tannins and which, to his mind, often have a chimichurri-esque character to them. 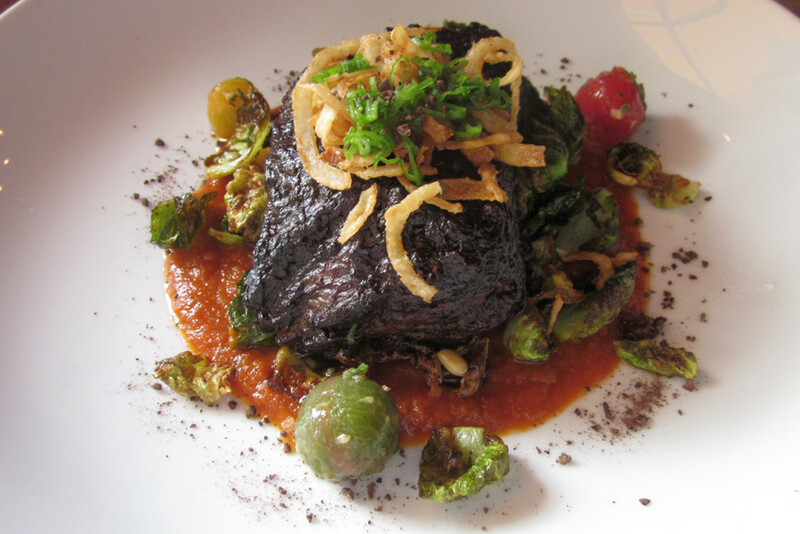 He cites their Birria Mascota (bone-in short rib, roasted tomato salsa, cocoa nib), which is braised and seared, as a good match for these wines. The Birria Mascota dish at Caracol, which pairs beautifully with Ribera del Duero. In addition to the Finca La Mata Ribera del Duero he pours by the glass, Beck has devoted a full page of his list to the famed Vega Sicilia winery and its sister property, Bodegas Alion. Regardless of the particular pairing, Beck’s overall philosophy is this: “Wine is not a luxury.” For him, wine is one the joys of life. He believes that wine should be a healthy part of living and, moreover, wine makes food taste at its best.